FACEBOOK CAMPAIGN: The EMSB began a new promotional campaign for our Facebook page (@EnglishMTL) earlier this summer. As a result, traffic has increased significantly while our likes have gone from just under 4,000 to over 7,000. SPIRITUAL ANIMATION SERVICE RECOGNIZED: The Canadian Race Relations Foundation recently recognized the EMSB's Spiritual and Community Animation Service for its ongoing efforts to foster racial harmony, cross-cultural understanding and eliminate racism. The honour was bestowed upon the Spiritual and Community Animation Service at the recent Canadian Race Relations Foundation conference in Toronto. EMSB Chair Angela Mancini notes that submissions for this year spanned the country and highlighted a great number of communities, issues and approaches.“The Jury Panel was impressed with and encouraged by not only the high caliber of our initiatives, but also by the creativity and passion which underscored the commitment to address communal needs as they relate to positive race relations, diversity, inclusion and good citizenship," said Mr. Lofoedo. VMC ARE G!EE WINNERS: The television show Glee may no longer be on the air, but the local high school competition of the same name is alive and well. Last Sunday, Nov. 20, the seventh annual G!EE High School Showdown took take place at the Oscar Peterson Concert Hall of Concordia University in NDG and the EMSB’s Vincent Massey Collegiate in Rosemount came in first place. Teachers Jessica Monti and Stephanie Rossy along with dance coordinator Niki Angelis, guided performers Alessia Petraroia, Angelica De Luca, Roxanne Nadeau, Angela Maturi, Felicia Sabatino, Joseph Marra, Emma Rose Miele, Katherine Iadeluca, Gianna Scarapicchia and Emily Estrela. The Vincent Massey winning G!EE team. This year there were teams from 14 local high schools competing in the largest show to date. That’s 140 participating students who sang and danced their hearts out on stage. 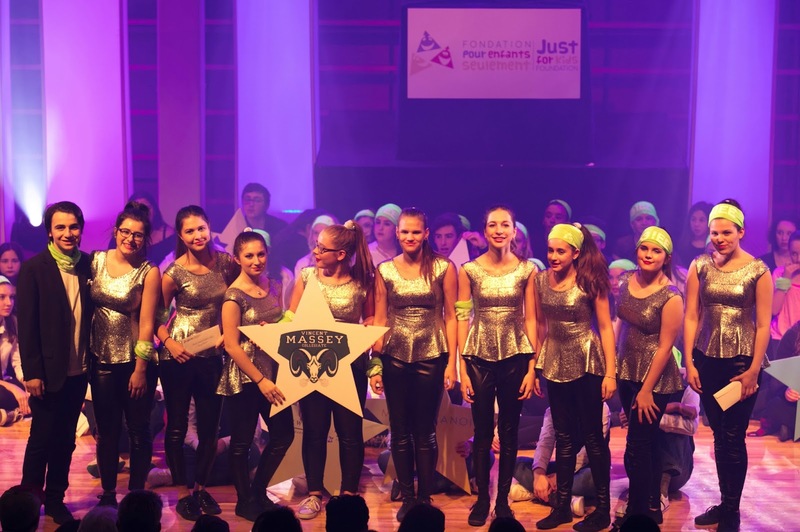 They raised money on behalf of the Just for Kids Foundation (JFK) to purchase urgently needed medical equipment for the Montreal Children’s Hospital’s departments of Ophthalmology, Cardiology, Cranio-Facial Surgery and the NICU. Other EMSB participating schools were Laurier Macdonald in St. Léonard, Royal Vale in NDG and Royal West Academy in Montreal West. VMC was also the second highest fundraising team at $6,422. The show raised $126,650 for the cause, G!EE 's largest total yet. BRIEF ON EDUCATIONAL SUCCESS: The EMSB has responded to the consultation process launched by Minister of Education Sébastien Proulx on education success with a comprehensive brief entitled Towards a Policy on Educational Success: Education, Let’s Talk about the Future. It was presented on November 4 in Montreal. Prepared by the EMSB Education Committee, composed of commissioners, board directors, in-school administrators, parents and elected representatives of the unions, many of the recommendations include, but are not limited to: all students achieving their full potential; a favorable context for student learning, personal development and success; and mobilization of partners and stakeholders in support of educational success. Starting school earlier, at the age of four for example through a Pre-Kindergarten program, would be beneficial. However, extending the compulsory school age from 16 to 18 in youth is not optimal and will likely have little positive impact on “engagement” for at risk students. All students should have an opportunity to explore options for the future via the curriculum. As such, self-exploration type courses should begin to be offered at the elementary school level and not be geared to only at-risk students as all would benefit. Click here for our press release. Minister of Veterans Affairs Kent Hehr with VMC staff and students. REMEMBRANCE DAY: EMSB schools were once again very active during the days leading up, on and even after Remembrance Day. Gerald McShane Elementary School in Montreal North honoured veterans and current Canadian Forces Members and marked the 100th anniversary of the Battle of Beaumont-Hamel, the 60th anniversary of United Nations peacekeeping missions as well as recognize the 100th anniversary of the formation of the second construction battalion, which was Canada’s first all-Black battalion. Dalkeith Elementary School in Anjou commemorated the 100th anniversary of the Battle of Vimy Ridge. In attendance was Master Corporal Eric Washburn and Corporal Laurier Chabot. 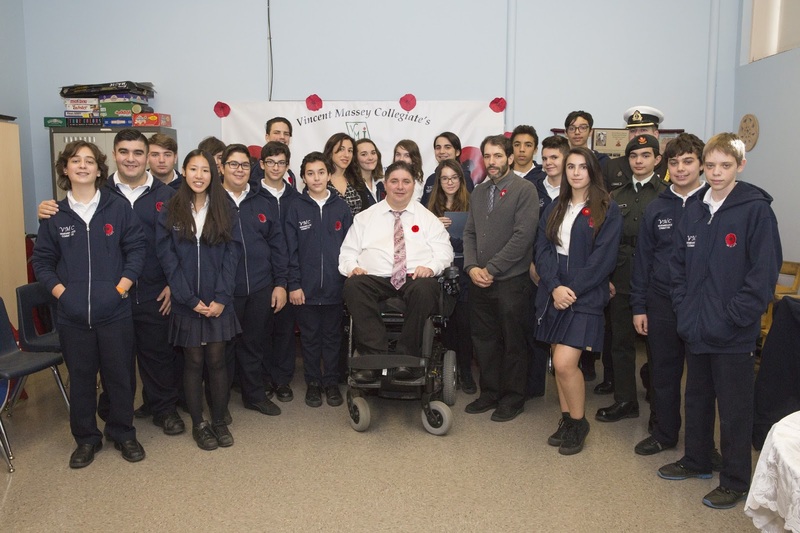 Vincent Massey Collegiate in Rosemount welcomed the Member of Parliament for Calgary Centre and Minister of Veterans Affairs Canada, The Honourable Kent Hehr. Perspectives I & II in St. Michel commemorated the 100th anniversary of the Battle of Vimy Ridge and Canadian military service. In attendance was Sergeant Petrou and Corporal Laurier Chabot. James Lyng High School in St. Henri welcomed Captain Waterhouse. East Hill Elementary School in R.D.P. honoured veterans and current Canadian Forces Members. Royal Vale School in NDG welcomed Captain Maghakian and Master Corporal McCarthy. Edward Murphy School in Hochelaga-Maisonneuve honoured veterans and current Canadian Forces Members. Nesbitt School in Rosemount commemorated the 100th anniversary of the Battle of Vimy Ridge and Canadian military service. In attendance were Sergeant Petrou and Captain Adam Baker. St. Monica Elementary School in N.D.G welcomed Master Corporal McCarthy and Corporal Srihanu. St. Gabriel Elementary School in Pointe St. Charles welcomed Member of Parliament for Ville Marie-Le Sud Ouest-Ile des Soeurs Marc Miller, as well as Master Corporal Lacroix as our guest speakers. Merton School in Côte Saint Luc welcomed Member of Parliament for Mount Royal, Anthony Housefather. Close to 200 Westmount High School alumni gave their lives in the Great War and World War II, including Fred Fisher, the first Canadian to be honoured with the Victoria Cross. They were remembered and honoured on that day with dignity and gratitude they so deserve. MP Marc Miller was in attendance. Marc Garneau (third from right) with two students and Regional Director Pela Nickoletopoulos, Commissioner Joseph Lalla, Principal Carmen Nicolas and Vice-Principal Vito Campbell-Guerriero. of Transport, the Honorable Marc Garneau. In addition to speaking about Remembrance Day, he answered all kind of questions from students - many related to his career as an astronaut. John F. Kennedy High School in St. Michel, James Lyng High School in St. Henri, and Vincent Massey Collegiate in Rosemount all participated in the official Remembrance Day ceremony in downtown Montreal. CJAD APPEARANCE: Bravo to Spiritual Community Animator Rocco Speranza, his son Tedario and Vincent Massey Collegiate classmate Bryan Kovac for their appearance on CJAD November 10 to talk about Remembrance Day. Tedario will be featured on WE Day Toronto coverage on Monday, November 28 (11 pm) on MTV and Much Music, with a special encore presentation on Saturday, December 10 (7 pm) on CTV. LARA BELINSKY’S SHAVING: Last month we told you about Willingdon Elementary School physical education teacher Lara Belinsky, who shaved her head as part of a campaign which raised over $27,000 for their local Terry Fox Run. Here is our video footage of the actual stage. At the very end please watch Principal Carmen Nicolas’ outstanding singing performance. ÊTRE BILINGUE: The EMSB is thrilled with the positive reaction we have received for our new promotional campaign on bilingualism. To mark the start of the 2016-2017 academic year, the new EMSB slogan “Être bilingue, c’est gagnant!” promotes the fact that being bilingual represents a winning formula. The EMSB has embarked upon a special marketing campaign, complete with specific signage and promotional items, in order to have these words at the tip of everyone’s tongue. “Under the Charter of the French Language, a certificate of eligibility is generally granted to children who did the majority of their elementary or secondary studies in English in Canada; whose mother or father did the majority of his/her elementary studies in English in Canada or whose brother or sister did the majority of his/her elementary or secondary studies in English in Canada. SPIRIT OF GIVING: In preparation for the holidays, the EMSB will once again be teaming up with the Canadian Armed Forces to support CTV Montreal’s annual “Spirit of Giving” campaign, which brings much needed assistance to the less fortunate throughout Montreal. More than 40 schools and centres will take part in the campaign as well as some community organizations. Vincent Massey Collegiate will serve as the main hub for the collection. Principal Franca Cristiano is thrilled to have his facility assume the role of the main hub for the very first time. Many of the participating EMSB schools will organize a series of events set to encourage donations, and a number of schools will be featured on CTV Montreal’s mid-day and nightly news programs throughout the duration of the campaign. The campaign will conclude with a live broadcast from Vincent Massey Collegiate on Thursday, December 15 at 6 p.m. There will be several live noon-time reports on CTV. Schools for that will be announced soon. “I wish to thank everyone for their generous contributions and ongoing support to the Spirit of Giving campaign,” said EMSB Chairman Angela Mancini. For highlights of the 2015 campaign, please watch this video. Marc Hall with parent Mitchell White and two students. PROM QUEEN THE MUSICAL: Royal West Academy held their fundraiser for a new auditorium at the Segal Centre with nearly 150 guests attending Prom Queen: The Musical on Oct 27. This marked the world premiere of an outrageously fun, new musical celebration about being true to yourself in the face of adversity. Prom Queen: The Musical is based on the true story of Marc Hall, the Ontario teen who took his Catholic District School Board to court for the right to bring his boyfriend to prom. His fight for equality rallied a town, made international headlines and inspired a nation. Marc Hall was in Montreal and visited Royal West on November 1 during the students lunch hour. He spoke, answered questions and posed for many pictures. Royal West has an active LGBTQ (Lesbian, Gay, Bisexual, Trans, or Questioning) student club. A scene from The Bardolators' latest production. SHAKESPEARE: The Bardolators, a group of Royal West Academy students directed by Doug Floen, presented William Shakespeare’s classic “Romeo and Juliet” recently. 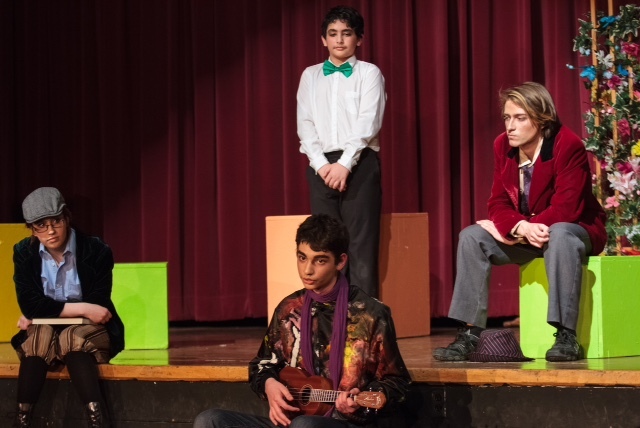 The Bardolators are Royal West`s Shakespeare troupe, composed of Grade 8 to 11 thespians who enthusiastically studied Shakespeare’s classic play “Romeo and Juliet” in anticipation of their upcoming shows. The students have devoted many hours of rehearsals under the direction of Floen, their long-time Artistic Director and founder of the group, and their love of the Bard shines through in their captivating performances. The group is also assisted by retired teacher Sidney Westlake and English teacher Gloria Koyounian. “Romeo and Juliet” is one of the Bard’s most popular romantic tragedies. A long feud between the Montague and the Capulet families disrupts the city of Verona and causes tragic results for Romeo and Juliet. Revenge, love, and a secret marriage force the young star-crossed lovers to grow up quickly - and fate pushes them to a tragic end. HUMAN RESOURCES PROJECT: Staff from the EMSB Human Resources Department have chosen to collect donations for Samaritan’s Purse. This is a great organization that is devoted to helping those in need in Canada and abroad. This is the season to give and there are a lot of ways to do so. If you would like to donate, please see Eleni by December 20. She can be reached at 514-482-7200 ext. 7498 or EIoannidis@emsb.qc.ca. "We are very fortunate and blessed to live in North America and be numbered amongst the most prosperous, healthiest, happiest and safest inhabitants of the world," says Eleni. TACKLING ABUSIVE RELATIONSHIPS: Westmount High School has been collecting items (toiletries and clothes) for the past few weeks in a hopes to obtain over 3,000 products for the Women’s Aware Women’s Shelter. The school has already surpassed their goal, over 4,000 product collected. Vice-Principal Amanda Vallelunga says this is part of their Safe Schools initiative, which has as its goal to reduce bullying in schools. "This month we decided to tackle the subject of abusive relationships," she says. "A representative from the women’s shelter met with all of our Secondary III students to explain to them what constitutes abuse -physical, emotional and verbal- and what to do if they find themselves in this situation. Staff and administration also videotaped ourselves explaining to the students why this initiative is important. All students saw these videos in their homeroom period. English teachers were also asked to create a unit on the subject so that all students understood its importance. " The final packing of products and the handing over of them to the shelter will be taking place on Monday November 28 at 3:30 pm in room 301 of the school at 4350 Ste, Catherine Street West. 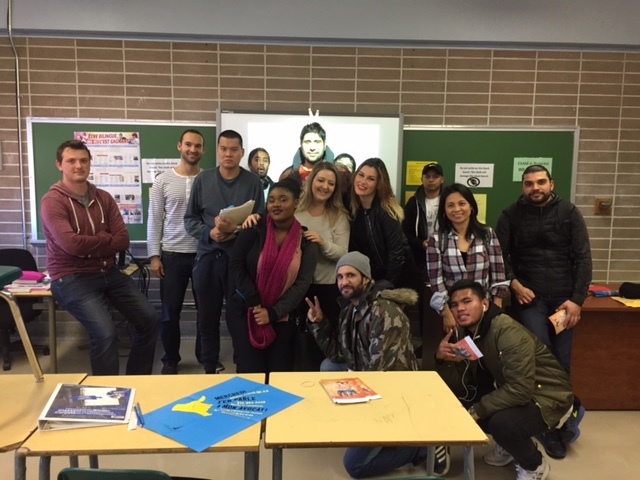 WOTP AT JFK: On October 18, students from the Work-Oriented Training Path (WOTP) program at John F. Kennedy High School in St. Michel took part in a workshop led by members of the STM Prevention & Safety Unit. STM Police Inspectors Botnaru and Longpré pictured here with members of the JFK WOTP (along with teachers Anthony Tonin and Stefan Kazamias) provided students with valuable information regarding rules, regulations and safety within Montreal’s bus and metro system. This workshop is available upon request from the STM and is conducted in French. To book a workshop, any staff member or administrator can reach the inspectors at (514) 280-6201. Angelo Marino, Joseph Lalla, Patrizia Ciccarelli, Angela Mancini, Sylvia Lo Bianco, Joanne Charron, Anne Marie Matheson. MACKAY GROUNDBREAKING: The official groundbreaking ceremony for the new $21.9 million state-of-the-art facility for the Mackay Centre and Philip E. Layton Schools took place on November 2. The facility will be built on a now empty piece of land located on Terrebonne Street, between Benny and Madison Avenues, in NDG. The EMSB has owned the green space for decades. The field is currently under municipal custodianship and is being used as an informal playing field by the public and the neighbouring Commission scolaire de Montréal (CSDM) elementary school École Marc-Favreau. The James Lyng crew in Minnesota. JAMES LYNG PROJECT: A group of four teachers from James Lyng High School in St. Henri recently joined two researchers from McGill University and a teaching artist from the WORD youth literacy program to visit the High School for Recording Arts (HSRA) in St. Paul, Minnesota. 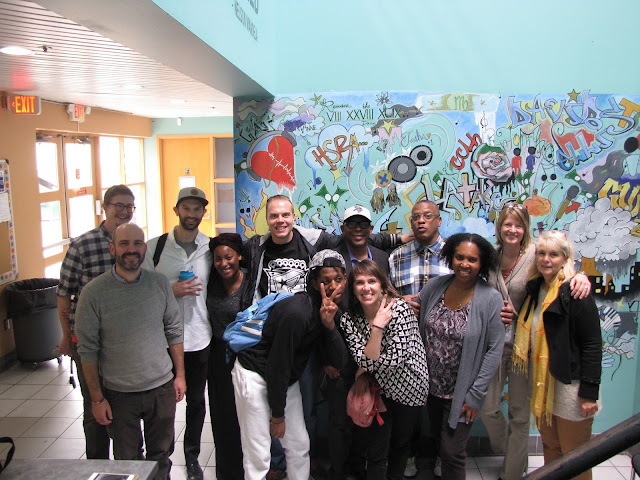 The goal of this trip was to learn best practices for culturally relevant, social justice-oriented education rooted in hip hop culture. 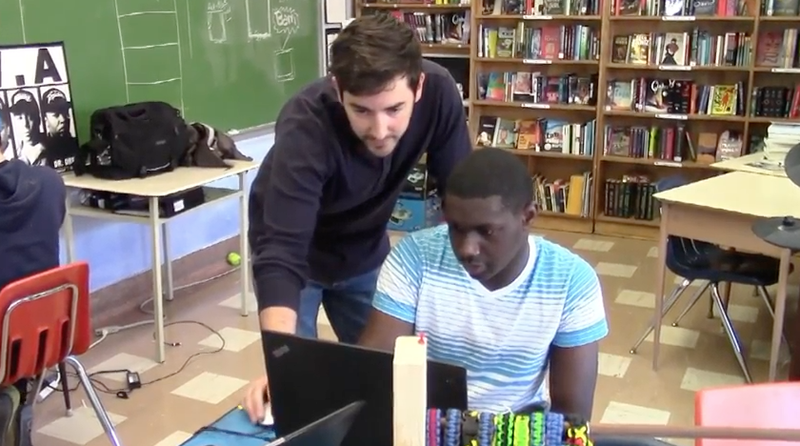 The teachers and students of James Lyng have partnered with McGill University and three Montreal-based community organizations: Under Pressure (graffiti), WORD (recording arts & spoken word), and the YMCA in Pointe-Saint-Charles, to develop their own, innovative approach to educating young people. The school-university-community partnership is unique in its approach to education reform via the combined forces of its three-partner model. This year, James Lyng has launched the second year of its “Urban Arts, Inspired Minds” comprehensive school reform project. With the goals of increased student engagement, autonomy, advocacy, critical literacy and academic achievement, James Lyng is working to build an approach to learning that allows students to construct their own projects and align those projects to provincial standards. In the past year, students have received provincial press coverage of a student-run art gallery, featuring art work such as painted skateboards from students, and a school-wide hip-hop arts festival. Students also collaborated with local muralists Hoar Koar to paint the front of the school building in student-derived images. This year, students are developing a cross-curricular project exploring the history of the Turcot exchange. See our press release. Students got to hold a real brain. TOONIE CHALLENGE: Roslyn Elementary School in Westmount was the site on November 4 for the launch of both the Friends of the McGill University Health Centre (MUHC) Toonie Challenge and a concussion awareness program led by a former Canadian Football League player. Approximately 250 students from more than a dozen local schools attended the fifth annual MUHC Toonie Challenge Event. This has become a delightful program where members of the MUHC community give their time to demonstrate and explain to students the important work they do at the hospital. Some of the exhibitors this year include Pediatric Dentistry, Infection Control, Nutrition, the Research Institute and many more. Keynote speaker Dr. Preetha Krishnamoorthy, Pediatric Endocrinology at the Montreal Children’s Hospital, presented the students two items the hospital needs: a Baby Scale with trolley for complex care ($7,500) and Books for the Family Resource Library ($7,000). The students voted (by secret ballot!) for which of these items to purchase with the toonies they raise this year and opted for the scale. Fundraising happens in all the various schools, after the Toonie Challenge. Students can choose to hold any fundraiser they wish such as Free Dress Day, a Bake Sale, sell Smoothies for Toonies, Pajama Day etc. The toonies will be gathered on May 31, 2017. Tim Fleiszer signs autographs and answers questions. CONCUSSION AWARENESS: The concussion awareness program is being coordinated by the McGill University chapter of Concussion Legacy Foundation Canada, whose mission is to advance the study, treatment and prevention of the effects of brain trauma in Canadian athletes and other at-risk groups. It was founded by former CFL player and four-time Grey Cup champion, Tim Fleiszer, in December of 2012 to help solve the concussion crisis in Canada. Since that time, CLF Canada has operated concussion prevention/education initiatives across the country. Fleiszer is a former Roslyn student and he will be at the launch. The Concussion Education Program is a proactive approach designed to raise awareness about the seriousness of concussions and to prevent the negative effects that can result from inadequately managed concussions. Trained volunteers deliver age-appropriate presentations about concussions through discussion, video, and interactive games to students in Grades 1 to 11. Students learn about what it means to have a concussion, signs, symptoms, and how to make smart decisions about re-joining activity. The program focuses on empowering students and student-athletes with the knowledge they need to take concussions seriously and foster a safer concussion culture. Schools interested should contact Katherine Baker at kbaker@emsb.qc.ca. MINI BISTRO: See our new video from the EMSB`s Nutrition and Cafeteria Services. Here is the French version. communities to the development of our Quebec society. A survey will be sent out shortly to all history teachers. The results may be finalized in time for the December 14 Council of Commissioners meeting. PED AT LHA: Students from LaurenHill Academy in St. Laurent marked the arrival of autumn by giving thanks for what they have, and recognizing that others are less fortunate. 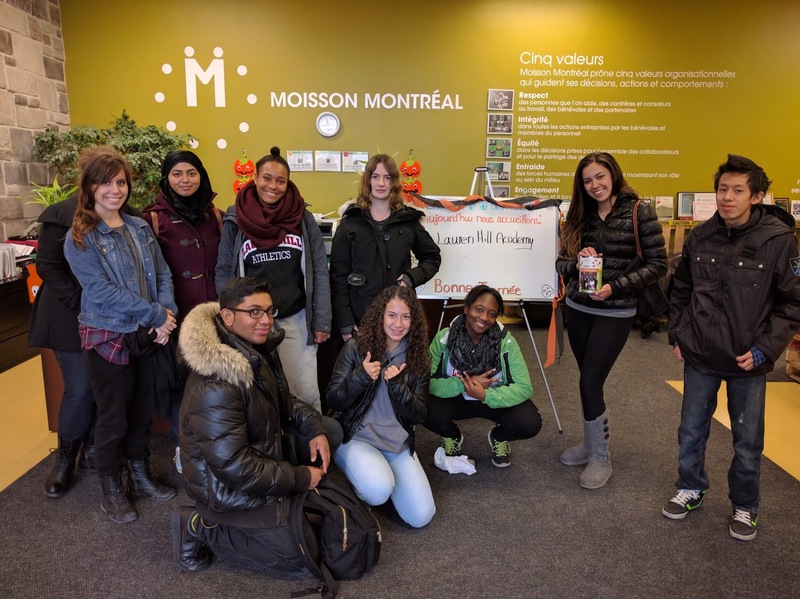 Leading up to a recent Positive Effort Day (PED), the students at LHA learned how many of their neighbors struggle to put food on the table on a daily basis, as well as all the good work that local food bank, Moisson Montreal, does for the city. With that knowledge, the Spirit Quest team, led by Spiritual Community Animator Samantha Page Smith held a fundraiser in which students brought in dishes that represented their cultural backgrounds to be sold during lunch. A $2 donation to Moisson Montreal bought students a taster plate of six items from around the world, in which over 20 countries were represented. Capping off the project was the PED Day, whereas students volunteered at Moisson Montreal sorting food in the warehouse as well, LHA students still smiling after a day of sorting frozen meat at Moisson Montreal. LOOKING AHEAD: Staff from the EMSB Educational and Technology Services Department were represented at the Canadian Parents for French and the Office of the Commissioner of Official Languages conference entitled Perspectives d’avenir – Looking Ahead: What now for French Immersion? at Vanier College. French Immersion began 50 years ago thanks to the efforts of a group of dedicated parents on Montreal’s South Shore. To respond to context of the time, these parents realized that their children would have to learn the language of the majority to thrive in Quebec, and established the first French Immersion program in the country. Many similar programs were implemented over the years and French second language learning has become an increasingly valued part of instruction in the English School Boards. Fifty years later, this bilingual symposium aims to celebrate how far we’ve come, but also to examine the state of French Second Language programs and their outcomes for English-speaking youth in Quebec, both pedagogically and socially. Several researchers spoke to these issues. There was also a moderated discussion, in which these challenges were examined and in which concrete solutions for the coming 50 years were proposed. Info: mwilliams@cpf.ca. ANTI-BULLYING: On Friday, February 6, 1998, 10 year-old Myles Neuts was found hanging on a coat hook in the washroom of his school. Now, for over a decade, Myles’ father, Mike Neuts, has spoken out against bullying to thousands of students, teachers and parents. He continues to do so with a frightening truth that every parent, child and care-giver should hear. By advocating peer mediation, respect for differences and community collaboration, Mike has turned their family tragedy into a message of hope and change. John Paul I Junior High School was pleased to welcome Mike Neuts as a guest speaker. He shared his story with students during the day and extended the same opportunity to parents in the community during an evening workshop. SPOTLIGHT ON THE ARTS: The eighth annual Spotlight on the Arts will take place on November 25 at the Palais des congrès as part of the annual Quebec Provincials Association of Teachers (QPAT) Convention. Each year, this effervescent event brings together teachers from across the province, as it uniquely addresses the needs of Visual Arts, Music, Dance and Drama educators in the Quebec Anglophone sector. The Spotlight provides stimulating opportunities for teachers, students, and artists to work side by side throughout a full day of learning, sharing and creating. The focus this year is: Creativity and the Art of Taking Risks. The keynote speaker will be Dr. Douglas G. Boughton, Professor of Art and Education, Northern Illinois University, will launch our day with Risky Business: The Arts and Creative Production in School. Throughout the day, generalist and specialist teachers of any of the four art disciplines may attend elementary or secondary hands-on workshops, expertly led by EMSB Arts Consultant Nicolas Doyon, along with Melissa Ledo, Katie Green, Martin Labrie and Jesse Stong. These dynamic workshops will provide inspiration for meaningful art teaching and explorations that can be taken back immediately into the classroom. Teachers and arts organizations/associations will sit together to participate in a lively Round Table discussion: Risky Business: The need for failure and mistakes in education. All teachers are invited to join a pop-up creative space where they can explore and familiarize themselves with different techniques, materials and tools that can be brought back to the classroom to use with students. EMSB BOOTH: Please come visit the EMSB booth at QPAT November 24 and 25. We will be at table Number Three. IT’S A WONDERFUL LIFE: Geordie Productions has begun their kick off for the 2016 holiday play: It’s a Wonderful Life, with four shows set for December 9 and 10 at the DB Clark Theatre of Concordia University’s downtown Hall building. The EMSB will be donating The Granville House, a playhouse constructed by retired Merton School teacher Nicole Scully and EMSB science and technology consultant Sarah Iatauro. Sculley builds dollhouses for her nieces and her friends children. The detail in every house is truly a work of art. Over the years she has donated the benefits of her talents to different charities. This beloved holiday classic comes to captivating life with the help of a dynamic large ensemble and live Foley sound under the imaginative direction of Geordie’s own Artistic Director Mike Payette. Join some of Montreal's most celebrated business, legal and media leaders performing on stage in a beautiful retelling of this timeless gem. Returning this year to be a part of this holiday motley crew are “The Three Judges”: Justices Jean-François Buffoni, Pepita Capriolo and Brian Riordan (who played Scrooge in last year’s gala A Christmas Carol) playing the antagonist Mr. Potter. Geordie Holiday Gala alumni Tracey McKee and EMSB Arts Education Advocate & Consultant Nicolas Doyon will also return to show their support. CBC’s Sean Henry steps up for the first time, as does celebrated endocrinologist David Morris, and 20 other prominent local businessmen and woman, including Geordie Board past and present presidents Robert Gervais (President, ZEROFAIL Solutions) and John Raza (President, Campbell & Cameron Volkswagen). Log on to www.geordie,ca for more details. See flyer. Pet Therapy at St. Raphael. PET THERAPY: St. Raphael School in Park Extension is very proud of the pet therapy program that is offered there. 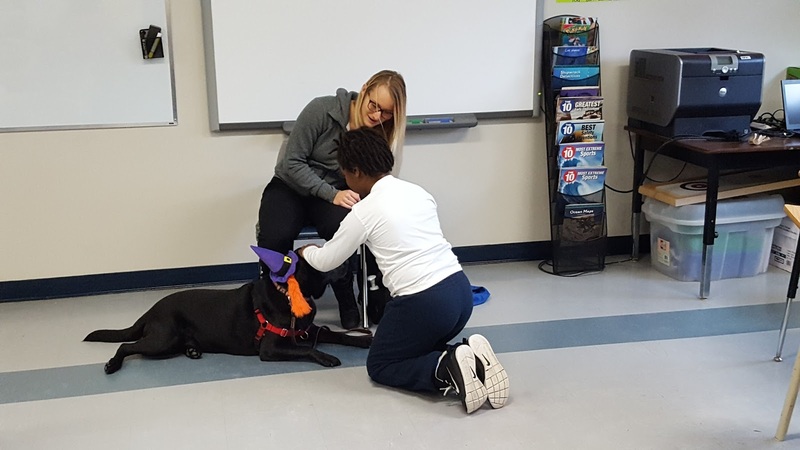 Zootherapie Quebec is an organization that uses dogs in a therapeutic manner, to reach students who have a variety of needs. Through this program, they are able to assist our students in developing their social skills in a wide spectrum of areas including respect, communication and management of emotions. Once a week, our students are thrilled to participate in this activity. Students, parents and staff members have reported that they have seen the benefits of this program and the positive effects that it has on our students. WORKING WITH TANDEM: At Royal Vale School in NDG, the team has taken a stance against bullying and is fostering collaborative partnerships with community organizations such as Tandem to ensure a more harmonious world for future generations. Grade 5 students explored the three ingredients of bullying, including power, the intention to harm and repetition and they also discussed strategies to deal with it. With Tandem coach Joseph Lambert, the students took a pledge to practice more kindness. Mr. Lambert and the students will also be discussing internet safety, violence in the media and cultural diversity throughout the academic year. HOLISTIC EDUCATION: At Royal Vale, the teaching staff believe in holistic education that inspires not only their students' minds, but also their overall well-being. They believe in helping students cultivate the knowledge to make healthy choices. 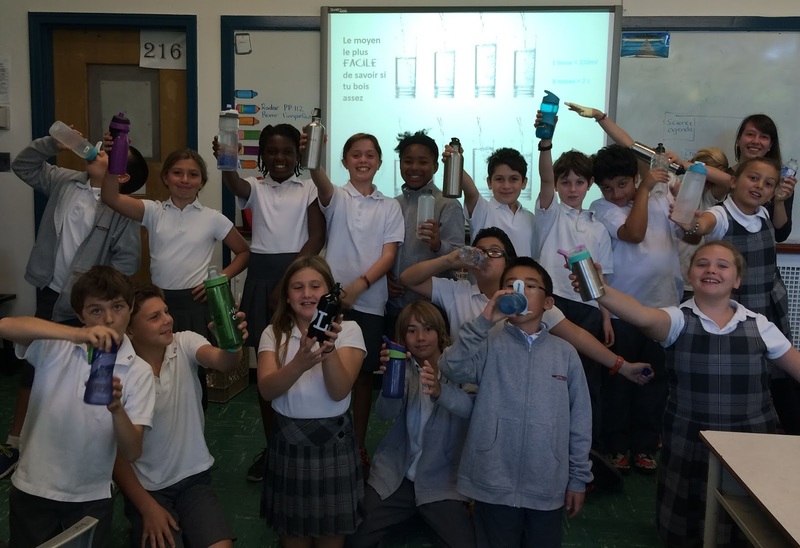 With the guidance of the board's nutritionist, Emily Hamilton-Leavitt, the Grade 5 health detectives explored the importance of healthy hydration during a Sip Smart workshop. The students discussed the impact of consuming sugary drinks versus healthier options such as milk and water on their health. SENSITIZATION TO HEARING LOSS: With the help of Patey Yeh, an MOSD itinerant specialist, Royal Vale students explored the FM system used to help students’ who have a mild hearing loss communicate with more confidence. They discussed its purpose, its range and its advantages. The FM is a wireless system that is made up of a transmitter microphone that teachers or students presenting wear and a receiver that a student with a hearing loss wears. There are currently six Royal Vale students who use the wireless FM system as a learning tool. Meeting the different needs of our students is definitely a high priority on our agenda at Royal Vale. STUDENT MENTEE: Devon Packer, a Grade 6 student at Royal Vale School, popped into visit his Grade 5 schoolmates as a mentee. His former teacher, Nathalie Malhamé, invited Devon to lead an art class and to help her current students develop art criticism skills. She had been impressed by the extent of Devon’s passion for and knowledge of art. The discussion compared Leonardo DaVinci’s Mona Lisa with Impressionist Art and aimed at awakening different emotional responses in students. The students were extremely engaged in the discussion lead by Devon whose personality is full of charisma and excited energy as could be seen by their raising hands with enthusiasm and giving Devon their full attention. Devon also performed on the piano in front of several classes including both Grades 5 and 2 classes during meditative sessions. At Royal Vale, learning is very much student centered. DRAMA AT ROYAL VALE: EMSB Arts Consultant Nicolas Doyon will be returning to Royal Vale to continue to accompany students during their exploration of La Commedia dell’Arte. In preparation for his visit, Grade 6 students, who have become experts in playing the role of lovers ‘Isabella’ and ‘Flavio’, have been training Grade 5 students to take over the lead roles. The students have discussed the sacredness of masks, the importance of exaggerating stereotypical character traits and methods of overcoming the fear of ridicule. TERRY FOX RUN: Please see our video on the Terry Fox Run at Royal Vale School in NDG, featuring Olympic diving medal winner Meaghan Benefito. Sandra Banon and her students. 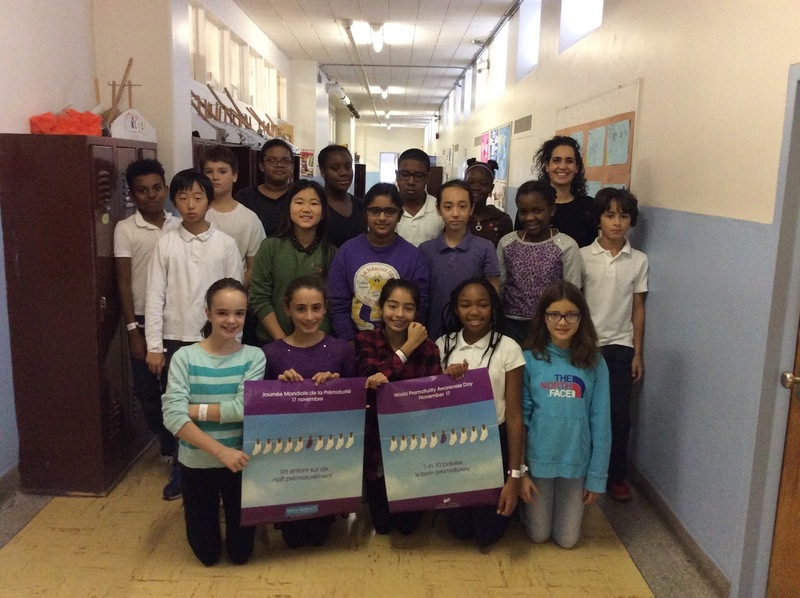 WORLD PREMATURITY DAY: To mark World Prematurity Day, teacher Sandra Banon from St. Monica Elementary School in NDG encouraged her students to wear purple to class on November 16 and raise funds for the Neonatal Intensive Care Unit of the Jewish General Hospital. Sandra is the mother of a former preemie who was born at 26 weeks. Her son attends nearby Royal Vale School. World Prematurity Day was November 17. It was marked that morning in the main lobby of the JGH. Spearheaded by The Tiny Miracle Fund, an initiative of the JGH Auxiliary, the program helps raise awareness of the magnitude of pre-term births and the miracles happening every day in the hospital. The commitment to support these tiniest and most vulnerable patients through the purchasing of vital medical equipment for the NICU is an important objective. Dr. Apostolos Papageorgiou, the world renowned Chief of Pediatrics and Neonatology at the JGH, will be in attendance speaking on behalf of the NICU team. Other speakers will include former NICU children and parents. There is a new state-of-the-art NICU at the JGH which opened last January in Pavilion K. To date, the Tiny Miracle Fund has raised more than $250,000 through various auxiliary fundraising projects. The Auxiliary has committed $500,000 to the hospital’s new neonatal intensive-care unit. St. Monica raised $450 for this first effort. Bancroft students inspect the monsters. MONSTER MASH: Throughout the months of October and November, teachers Christina Marie Phelps and Monica Paraghamian carried out a collaborative art project with Bancroft Elementary School and MIND High School Visual Arts students. The project was entitled "Monster Mash." Bancroft's Visual Arts teacher Isabelle Gagnon-Zober had provided the MIND team with simple monster drawings done by Bancroft students in classes. 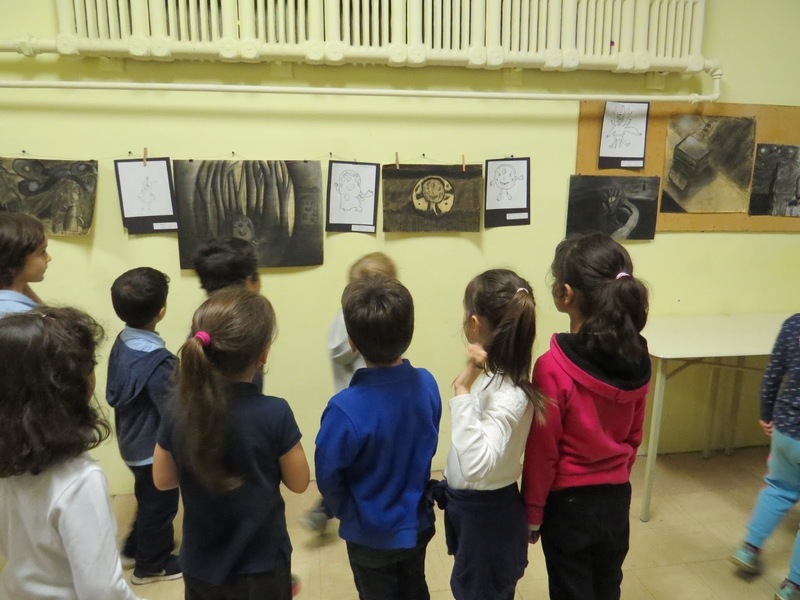 The Grade 9, 10 and 11 Visual Arts students then each selected a monster and rendered it in a charcoal drawing; giving the monster dimension texture, and adding context and depth to the background. The "Monster Mash" exhibit was on display from Nov. 16 to 23. 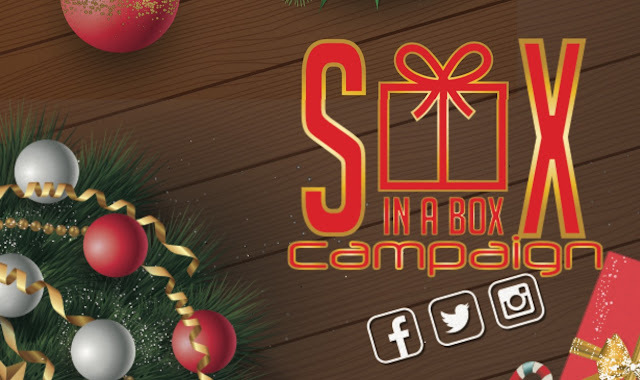 SOX IN A BOX: With the holiday season quickly approaching, students at Rosemount High School, Dalkeith Elementary School in Anjou and Honoré Mercier Elementary School in St. Leonard will be embarking on a campaign to collect and donate socks for Montreal’s homeless. Students and staff will donate new socks that will be donated to four shelters: The West Island Women's Shelter, Dans La Rue, Chez Doris and The Benedict Labre House. Each school will also create personalized holiday gift boxes containing the new socks and bilingual messages of hope for the holiday season. Furthermore, on December 7, staff members and students from each school will come together at Rosemount High School's Spiritual Community Centre (3737 Beaubien) for a holiday lunch and to personally gift wrap each donation. The campaign will be spearheaded by Spiritual and Community Animator Vince Lacroce, with the support and encouragement of administration teams of each school, as well as the help and support of Rosemount High teachers Nathalie Beaudoin, Emmanuela Lambropoulos and Jacklyn Di Genova, as well as Dalkeith teacher Sandra Trevisonno and Angela Di Lella from Honoré Mercier. HOMELESSNESS SUMMIT: With the winter quickly approaching, on Tuesday, December 13 (9 am), students and staff at Rosemount High School (3737 Beaubien) will host Breaking Down the Walls, a summit meant to foster a candid discussion about the plight of the homeless in Montreal. The summit will consist of testimonials from homeless Montrealers and shelter representatives, with the intention of addressing the stigma of mental illness, life on the streets and reintegration programs. Ultimately, the goal is to help both students and staff understand the needs of others in difficult situations, putting empathy and compassion into action. Participating in the education awareness program will be: The West Island Women's Shelter, Dans La Rue, Chez Doris and The Benedict Labre House. Currently, over 75 students from Rosemount High School continuously volunteer at various soup kitchens and shelters across the island. FUSION JEUNESSE VIDEO GAME CREATION: On November 17, Rosemount High School hosted Michael Penta and Charlène Boutin of the Fusion Jeunesse program, which focuses on experiential learning by implementing innovative pedagogical projects in schools that include various fields. Students were exposed to the video game creation process and were shown what it takes to put one together from scratch. Going over the pre-production, designing and promoting of a new game, the presentation was packed with details. From its infancy stages to the later phase of the creation timeline, they were taken on a journey through the video game birthing process by Penta, who's been on staff at Ubisoft, Montréal's premiere video game company for two years now. Fusion Jeunesse was created in 2008 with the mission of seeing less kids drop out. Through multiple programs that they've implemented, they have contributed to keeping students engaged with school. STUDENTS ASSOCIATION: On November 4, Lester B. Pearson High School in Montreal North hosted student leaders from across the EMSB for the first meeting of the year for the English Montreal Student Advisory Committee. The EMSAC gathers students monthly for meetings designed to hone their leadership skills through experiential activities, discussions and working on common projects. During the first meeting of the year, students discussed the government’s new proposed history program, the EMSB’s new policy on smoking, the EMSB’s “Être Bilingue, c'est gagnant!" campaign as well as making introductions to each other through ice breakers and a leadership activity. “We have an enthusiastic group of young leaders who are excited for what the year has in store for us,” said Paul Karpontinis, a teacher at LBPHS. The next meeting is on December 14 at LaurenHill Academy. Joseph Lalla, retired Edinburgh Principal Leah Auclair, Angela Mancini and Sylvia Lo Bianco. RETIREES DINNER: About 140 people attended the annual retirees' dinner, which took place on October 25 at the Plaza Volare Reception Hall, which is located at the Crowne Plaza Hotel in St. Laurent. The evening honoured 100 retiring employees of the EMSB who worked as educators, administrators, professionals and support staff, and whose combined years of service to the Board added up to 2,471 years. EMSB Chair Angela Mancini, along with Vice-Chair Sylvia Lo Bianco, Deputy Director General (Administration Division) Angelo Marino, several EMSB Commissioners, and senior administrators from Education Division East, Education Division West, Adult Education and Vocational Services, Human Resources, Office of the Secretariat and the Deputy Director General’s office, presented each retiree with a special thank-you gift of a Hillcrest crystalline pitcher. Some of the longest serving employees honoured that evening were former EMSB Translator Aline Zerounian, who retired after 52 years of service to the board; Judith Labow-Wugalter, who retired as a teacher at Sir Mortimer B. Davis after 49 years of service; Bernard Fagan, who retired as a Principal at High School of Montreal Adult Centre after 47 years of service; and James Reimer, who retired as a teacher at Edinburgh Elementary School in Montreal West after 37 years of service. PERSONNEL ADDITIONS: Manon Bourassa is the new translator at the EMSB head office while Maureen Baron has returned to the team in Education and Technology Services as an information and communications technology consultant. NEW SCHOOLYARD: General Vanier Elementary School in St. Leonard recently inaugurated their new schoolyard; celebrating the culmination of a $450,000 renovation project. The groundbreaking occurred last summer and renovations included paving, fencing, landscaping and marking. Furthermore, the school parking lot was renovated and green space was added. Finishing touches to the play area will take place in April 2017. Funding for the project came from the School Board as well as a portion from the PPO. Here are some photos. BEE-AUTIFUL PROJECT: Laurier Macdonald High School’s bees have become part of the family; creating learning opportunities in science class, inspiring students in Leadership, motivating volunteer opportunities and even getting technical in Media. All of the students are being touched in some way by this minute pollinator. Beginning last year, students wrote articles in French, English and Italian for different newspapers. Internally, they presented to all homeroom classes, staff as well created the “Bee Logo,” Facebook page and a number of Public Service Announcements. Outreach efforts were extended to elementary schools via video conference: Gerald McShane Elementary School in Montreal North, Mecatina Elementary in La Tabatiere and Ste-Agathe Academy in Ste-Agathe-des-Monts. Recently, students were engaged in the honey harvest and have taught their peers and elementary students about the bees in person via in-class visits and through assemblies. TOY TEA: Students from the EMSB will once again work towards collecting new toys for the 25th annual Christmas and Chanukah Toy Tea, to be held at Tudor Hall on the fifth floor of Ogilvy’s Department Store on December 7. The toys will benefit over 5,000 children who are being sheltered and protected from abuse or violence, as well as other children’s charities. This will be the 14th year of the EMSB’s involvement in the Toy Tea Campaign, which is an initiative of former Spiritual, Religious and Moral Education Consultant Irene Miller. Student representatives from each school, along with their respective spiritual and community animators, teachers, administrators and parent volunteers, will attend the event to drop off their donated toys and receive special certificates of participation from Claire Kruyt, the Toy Tea’s chairperson, along with Santa and Mrs. Claus. The event will also feature the singing of Christmas carols by several school choirs. “The Toy Tea is a good fundraiser and a good cause, because everyone understands where the toys go,” said Frank Lofeodo, the EMSB’s Consultant for Guidance and Spiritual and Community Animation. “What’s so beautiful about it is that no matter how many students participate in it, the commitment is always there, and the schools mobilize themselves to help out with the drive.” Schools can participate by collecting new, non-violent toys. While non-violent toys are preferred and can be delivered unwrapped to Tudor Hall between 10 a.m. and 4 p.m. on December 7, donations and cheques endorsed to the Toy Tea would also be greatly appreciated. Log on to www.toyteamontreal.org for more information. SPEECH LANGUAGE PATHOLOGISTS: The EMSB Centre of Excellence for Speech and Language Development recently hosted its annual conference for speech-language pathologists, resource teachers, classroom teachers, and special needs and literacy consultants from all English school boards in Quebec. Dr. Bonnie Singer (SLP), a leading expert in the field of language and literacy development, presented the “EmPOWER” method for teaching expository writing. Besides the three-day workshop, the training included five two hour online webinars. CHILD CARE WORKERS: Very successful workshops recently took place for all Childcare Workers of the EMSB's East and West sectors. Keynote speakers included Steven Atme, a young man who was diagnosed with autism at the age of four. He gave a very moving speech in which he sensitized the participants to the needs of students with disabilities. As well, CEGEP teacher Laura Malbogat focused on the environmental, social, and personal factors that contribute to stress as well as the skills, strategies, and mindset required to address the onset of stressful situations. SUICIDE PREVENTION: A group of psychologists and guidance counsellors were recently provided with intensive training, organized by Suicide Action Montreal, on risk assessment and suicide prevention which will also focus on best practices in suicide intervention. The training targets the competencies set out in the ‟Guide de bonnes pratiques en prévention du suicide à l’intention des intervenants des centres de santé et de services sociaux” published by the Ministère de la Santé et des Services sociaux (2010). As of this date, 28 EMSB professionals have been provided with this training and our hope is to train more in the future so that all psychologists and guidance counsellors will have had this very critical training. The Chorale is set for their Lyric Theatre show. CHORALE TO PERFORM WITH LYRIC: Tickets are now on sale for The Lyric Theatre Singers’ return to Concordia University’s beautiful Loyola Chapel, located at 7141 Sherbrooke Street West. From December 1 to 3 they will give four performances of Candlelight Christmas 2016, their highly anticipated annual holiday concert. 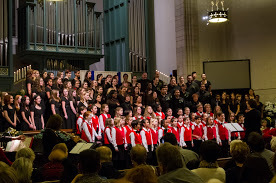 An additional treat this year is the special guest appearance by the EMSB Chorale Youth Choir, under the direction of Patricia Abbott, for one night only on December 1. The EMSB Choir will perform selections from their own Christmas repertoire, as well as lend their voices to a few Lyric Theatre Singers highlights, a collaboration that promises to be as heartwarming as it will be entertaining. Ms. Abbott, currently in her 27th year leading the EMSB Choir, is a frequent Juno Award jury member and helms several musical organizations including the Cantivo Chamber Choir and Les Voix du Carrefour. She has received several awards for her contributions to music including the Quebec choral federation’s Ordre du mérite choral and the Queen Elizabeth II Diamond Jubilee Medal. “I’ve known Patricia for over 25 years and am thrilled to share the stage with her and the EMSB Choir this year,” admitted Lyric Musical Director Bob Bachelor. “I deeply admire her dedication to fostering the love of music in people of all ages. We can’t wait to kick off the holiday festivities and share the spirit of the season!” As in previous years, donations of non-perishable goods are gratefully accepted for the NDG Food Depot. Info: www.lyrictheatrecompany.com. See this link for more. OTHER CHORALE NEWS: The Senior Chorale will sing at the Toy Tea event on December 6 at Tudor Hall at Ogilvy’s. The chorale presents its own annual Holiday Concert on Saturday, December 10 at 4 p.m. at Mountainside United Church (corner The Boulevard and Lansdowne). The 95 members of the Junior and Senior divisions of the choir will be under the direction of Patricia Abbott and assistant conductor Marie-Ève Arseneau, and will perform classical, traditional and contemporary music for the festive season. Special guests will be the Cantiamo Girls Choir of Ottawa, who hosted the chorale for a concert back in June. There are no tickets required for this concert. A collection will be taken up to offer to the Salvation Army for its Christmas campaign. Info: pabbott@emsb.qc.ca or 514-483-7200, ext. 7234. ENTREPRENEURSHIP IN FOCUS: While entrepreneurship is not an official course at Focus Alternative High School in NDG, through its Work-Oriented Training Pathway (WOTP) program students are learning the ins-and-outs of both the business and media worlds. Officially dubbed Matt Shapiro, a teacher at Focus High School. “From that, we decided that since we were doing the WOTP program, we would keep creating the videos, but turn it into a mini-business. We are constantly building and creating whatever we can think of.” Focus is one of eight schools in the English Montreal School Board’s Alternative Outreach system. The school welcomes students whom have had difficulties adapting to or learning in the mainstream system. See the full press release. Matt Shapiro and student Dondre. OFFICIAL LANGUAGES ASSEMBLY: Nicola Di Iorio, federal Member of Parliament for Saint-Léonard-Saint-Michel, is inviting residents to participate in a public assembly as part of the Government of Canada’s consultation on Official Languages. It is also possible to participate in the consultations by answering an online questionnaire. Click here for English and here for French. Nicola Di Iorio at Pierre de Coubertin Elementary School. These consultations will assist Minister Melanie Joly in her further consideration on key issues and actions to prioritize in the development of a new multi-year action plan on official languages. The Minister encourages Canadians to participate in large numbers in these consultations and share their perceptions and comments on the role of English and French in Canadian society. It takes place on Saturday, November 26 (2 pm) at the Salon des Gouverneurs, Centre Leonardo da Vinci (8370 boul. Lacordaire) in Saint-Léonard. INTERNATIONAL STUDENTS: Over the last couple of weeks, the last field trips for international students prior to the winter break took place and this time it was the turn for Westmount Park, Parkdale, Hampstead, Elizabeth Ballantyne, St. Monica, Willingdon and Roslyn to enjoy their pedagogical days visiting the five different ecosystems at The Montreal Biodome. There was a total of 80 students split into two dates that participated in the activities. In the afternoon, students enjoyed two movies related to space, stars and the origin of the world at the Montreal Planetarium. Students had a great time! At the end of the day they were eager to find out when the next field trip would be and where we would be taking them. Please follow this link to their Facebook page where you will be able to see the photo albums and videos of their outings. EDUCALOI WORKSHOP: Students from Lisa Trotto's Secondary V English class at the Galileo Adult Education Centre in Montreal North got a lesson on how to prepare to write persuasive essays. What better way to dive into this assignment than to engage in a heated debate with a legal professional? Zalman Haouzi, a lawyer specializing in Criminal Law and Tenant's Rights, stopped by to offer a few pointers. Students were highly motivated and engaged during Educaloi's workshop called Pick your side! This experience allowed students to take a position on relevant issues that stimulated a fiery class debate! Students witnessed firsthand how the concept of "justice" is constantly in flux and is shaped by clashing ideas and shifting societal beliefs. It was a highly informative class packed with energy and most importantly, each student left with a research topic! Some creative costumes for Halloween. 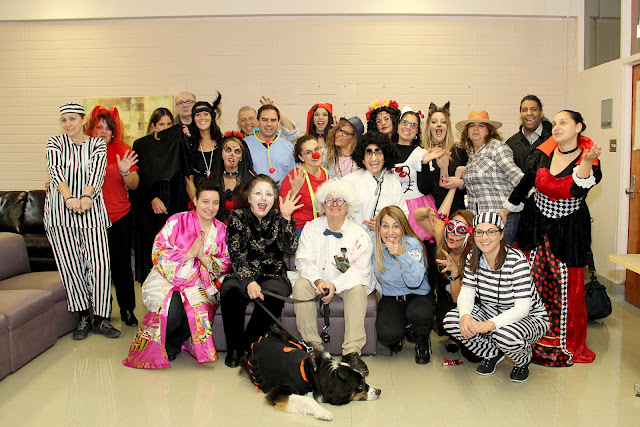 HALLOWEEN FESTIVITIES: The Halloween spirit was in full swing at Galileo Adult Education Centre during late October. The eager participation of teachers, students and office staff definitely made this a memorable one! The costumes varied from dressing up as witches to prisoners. Some disguises were frightening enough to send you running down the creepy hallways, where students and teachers took the time to decorate their own unique Halloween-inspired classroom doors. Prizes were then awarded to the class with the most spine-chilling and creative look. Along with the traditional festivities, candy and costumes, Galileo also took part in a worthy cause aimed to help those in need. Proposed by our very own academic student, Galileo participated in the campaign: We Scare Hunger. Classes joined together to collect food and help fight hunger for the youths of Dans La Rue. Over 450 cans were collected by our very own Galileo team and donated to the local food bank. Great work! MILITARY EXPERIENCE: On November 11 Galileo students filled the amphitheatre to hear soldier Robert Werbiski speak about his experience in the military and honoring his father's service during Operation Husky in 1943. The 25,000 ally soldiers took part in the 1943 invasion of Sicily was called Operation Husky, a deception plan to have the axis forces believe that the allies would invade through Greece. Robert Werbiski took students on the journey through a power point presentation complimented by anecdotal stories. In addition, the presentation of the short film on the 2013 Operation Husky March, concluded with viewing the ceremonies and concerts held at the Canadian portion of the war museum in Catania, Sicily. 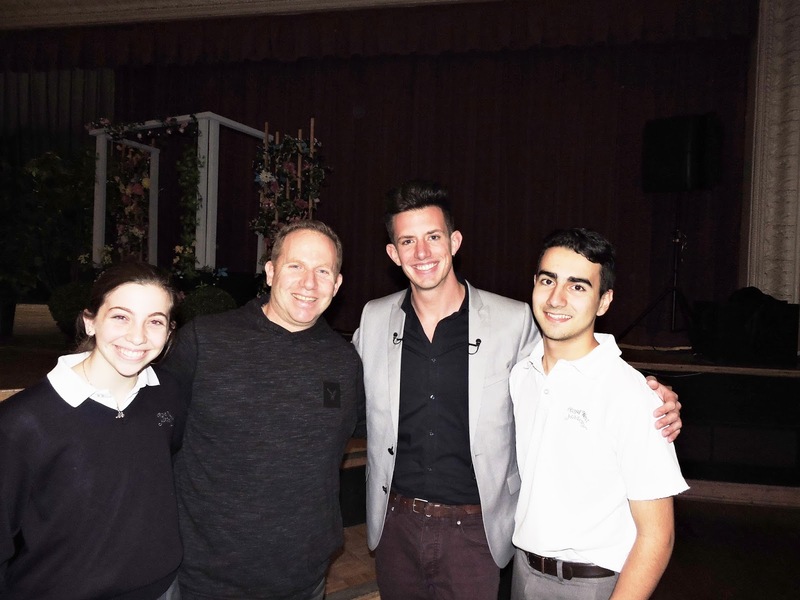 Given that the Galileo audience was composed of over 80 percent of Italian students who had never heard of Operation Husky, it had an emotional impact that exuded their learning about how their ancestors were a significant part of World War II History. This brought a connection to their learning that shall always be remembered, especially for their history exam. THANKSGIVING TREE AT NESBITT: As part of Thanksgiving celebrations, the Nesbitt Elementary School community recently launched a campaign to raise awareness of the values ​​of generosity and recognition. A spiritual ceremony was organized to bring students and teachers together in prayer. A large tree now stands majestically at the entrance, lined with maple leaves, with pupil recognition messages. PORTES OUVERTES – NOUVEAU SITE WEB : La CSEM a mis en ligne un nouveau site Web qui contient la liste complète de toutes les journées portes ouvertes dans ses écoles primaires et secondaires. On y accède au www.emsbopenhouses.com. NESBITT ÉRIGE L’ARBRE DE LA GÉNÉROSITÉ : Dans le cadre des festivités du Jour de l’Action de Grâces, la communauté de l’École Nesbitt lance une campagne de sensibilisation aux valeurs de la générosité et de la reconnaissance. Ayant comme source d’inspiration l’histoire : L’arbre généreux de Shel Silverstein, une multitude d’activités sont mises en place dans le but de faire comprendre aux élèves de l’école l’importance de donner à autrui et de reconnaître ce geste. Tout le monde est de la fête! Une cérémonie spirituelle organisée par Vince Lacroce, animateur de vie spirituelle et d’engagement communautaire, et Lise Beauchemin, enseignante de musique, rassemble les élèves et les enseignants dans la prière. De son côté, Joseph Nardelli, stagiaire de McGill, se sert des branches tombées dans son jardin pour ériger la structure de l’arbre; geste symbolique illustrant le lien entre l’homme et la nature. L’Arbre généreux se tient majestueusement à l’entrée garni de feuilles d’érable sur lesquelles figurent les messages de reconnaissance des élèves. Les paroles de la chanson : Heal The World résonnent de tous bords! L’arbre est heureux… Les enfants sont heureux. MÉMOIRE SUR LA RÉUSSITE SCOLAIRE : Un mémoire exhaustif intitulé Pour une politique de la réussite éducative – L’éducation, Parlons d’avenir a été préparé par la CSEM en réponse au processus de consultation lancé par le ministre de l’Éducation, M. Sébastien Proulx. Présenté le 4 novembre dernier à Montréal, ce mémoire a été préparé par le Comité de l’éducation de la CSEM composé de commissaires, de directeurs de la Commission, d’administrateurs d’école, de parents et de représentants élus des syndicats. Au nombre des recommandations qu’il renferme, mentionnons : l’atteinte du plein potentiel de tous les élèves; un contexte propice au développement, à l’apprentissage et à la réussite; des acteurs et des partenaires mobilisés autour de la réussite. L’entrée précoce à l’école, à l’âge de 4 ans par exemple grâce à un programme de prématernelle, serait bénéfique. Cependant, allonger la période de fréquentation scolaire obligatoire de 16 à 18 ans n’est pas une solution optimale et cela n’aura probablement pas un impact très positif sur la motivation des élèves à risque. Tous devraient avoir l’occasion de voir quelles options s’offrent à eux pour l’avenir. Par conséquent, des cours de type démarche exploratoire individuelle devraient être proposés dès l’école primaire et ne pas être destinés uniquement aux élèves à risque, puisque tous les élèves peuvent en bénéficier. CLIQUEZ ICI pour consulter le communiqué de presse. LARA BELINSKY A TENU PROMESSE : Le mois dernier, nous vous avons mentionné que Lara Belinsky, enseignante d’éducation physique à l’école primaire Willingdon, s’est fait raser la tête dans le cadre de la collecte de fonds qui a permis d’amasser plus de 27 000 $ au profit de la course Terry Fox. Voici une vidéo de l’événement. Nous vous invitons à écouter à la toute fin de la vidéo la remarquable prestation vocale de la directrice Carmen Nicolas : https://www.youtube.com/watch?v=sOTp1krE6qs. ÊTRE BILINGUE : La CSEM est très heureuse de l’accueil positif qu’a reçu sa nouvelle campagne de promotion du bilinguisme. Lancé dans le cadre de la rentrée scolaire 2016-2017, le nouveau slogan de la CSEM « Être bilingue, c’est gagnant! » met l’accent sur le bilinguisme en tant que formule gagnante. La CSEM déploie à ce titre une campagne de publicité complète assortie d’affiches et d’articles promotionnels afin de diffuser largement son message. Conformément à la Charte de la langue française, un certificat d’admissibilité est remis à l’enfant qui reçoit ou a reçu la majorité de son enseignement en anglais dans une école primaire ou secondaire au Canada; à l’enfant dont le père ou la mère a reçu la majorité de son enseignement primaire en anglais au Canada; ou à l’enfant dont le frère ou la sœur a suivi ou suit la majorité de ses études en anglais dans une école primaire ou secondaire au Canada. CAMPAGNE ANNUELLE SPIRIT OF GIVING : À l’approche des Fêtes, la CSEM fera équipe encore une fois avec les Forces armées canadiennes afin d’appuyer la campagne annuelle Spirit of Giving de CTV Montréal dont la mission vise à venir en aide aux plus démunis de la région de Montréal. Plus de 40 écoles et centres participeront à cette campagne, de même que certains organismes communautaires. Le Collège Vincent Massey servira de quartier général pour la collecte. Le directeur, Franca Cristiano, est ravi que son établissement ait été choisi pour agir à ce titre pour la toute première fois. Bon nombre d’écoles participantes au sein de la Commission scolaire English-Montréal organiseront une série d’activités en vue de recueillir des dons. En outre, certaines écoles seront à l’honneur dans le cadre des bulletins de nouvelles de CTV Montréal diffusés en après-midi et en soirée tout au long de cette campagne. Une émission en direct du Collège Vincent Massey sera diffusée le jeudi 15 décembre à 18 h pour clore la campagne. « Je tiens à remercier tous et chacun pour leur grande générosité et leur appui soutenu envers la campagne Spirit of Giving », a déclaré la présidente de la CSEM, Angela Mancini. Pour connaître les faits saillants de la campagne 2015, nous vous invitons à visionner la vidéo que vous trouverez à l’adresse : https://www.youtube.com/watch?v=FKNXoNcbbWQ&t=71s. PREMIÈRE PELLETÉE DE TERRE AU CENTRE MACKAY: La cérémonie officielle d’inauguration des travaux de construction du nouveau bâtiment ultramoderne de 21,9 millions de dollars pour le centre Mackay et l’école Philip E. Layton a eu lieu le 2 novembre dernier. Le bâtiment sera érigé sur un terrain vacant situé rue Terrebonne, entre les avenues Benny et Madison, à NDG. La CSEM est propriétaire du terrain depuis des dizaines d’années, mais il est actuellement sous la responsabilité de la Ville et utilisé comme terrain de jeu informel par l’école primaire publique Marc-Favreau de la Commission scolaire de Montréal (CSDM) qui se trouve à proximité. Le bâtiment accueillera quelque 200 élèves ayant des troubles du développement, ou une déficience visuelle, auditive ou intellectuelle. Ce sera la seule école à offrir des services d’adaptation scolaire et de réadaptation à la communauté anglophone au Québec et tous les élèves des neuf commissions scolaires anglophones du Québec y auront accès. Certains d’entre eux devront donc consacrer jusqu’à trois heures par jour au transport scolaire. Vous trouverez des photos de la cérémonie, le reportage de CTV News ainsi qu’une vidéo préparée par les élèves avant l’annonce officielle du financement, au https://vimeo.com/190031151. DÉFI TOONIE: C’est à l’école primaire Roslyn de Westmount qu’a eu lieu, le 4 novembre, le lancement du Défi Toonie des Amis du Centre universitaire de santé McGill (CUSM) et celui du programme de sensibilisation aux commotions cérébrales créé par un ancien joueur de la Ligne canadienne de football. Quelque 250 élèves provenant de plus d’une douzaine d’écoles locales ont pris part à la 5e édition annuelle du Défi Toonie du CUSM (http://thefriendsofthemuhc.org/toonie-challenge). Dans le cadre de cet extraordinaire programme, des membres de la communauté du CUSM donnent de leur temps afin de montrer et de décrire aux élèves l’important travail qu’ils accomplissent à l’hôpital. Cette année, certains collaborateurs représenteront notamment la Clinique de dentisterie pédiatrique, l’équipe du contrôle des infections, la Faculté de nutrition et l’Institut de recherche du CUSM. La conférencière d’honneur, Dre Preetha Krishnamoorthy, endocrinologue pédiatre à l’Hôpital de Montréal pour enfants a fait part aux élèves de deux grandes nécessités pour l’hôpital : un pèse-bébé avec chariot pour les soins complexes (valeur de 7 500 $) et des ouvrages destinés à la Bibliothèque pour les familles (valeur de 7 000 $). Les élèves ont tenu un vote secret afin de choisir ce qu’ils achèteront avec les pièces de 2 $ recueillies cette année. C’est le pèse-bébé qui l’a emporté! Des levées de fonds auront lieu dans toutes les écoles, dans le cadre du Défi Toonie. Laissées à la discrétion des élèves, les activités organisées pour les levées de fonds peuvent revêtir notamment la forme de journée sans uniforme, vente de pâtisseries maison, vente de smoothies à 2 $, journée-pyjama, etc. Les pièces de 2 $ seront recueillies le 31 mai 2017. SENSIBILISATION AUX COMMOTIONS CÉRÉBRALES: Ce programme de sensibilisation aux commotions cérébrales est sous la coordination du Chapitre de la Concussion Legacy Foundation Canada (concussionfoundation.ca) de l’Université McGill dont la mission consiste à faire avancer la recherche, les traitements et la prévention dans le domaine des traumatismes cérébraux chez les athlètes et autres groupes à risque au Canada. Fondé en décembre 2012 par Tim Fleiszer, joueur retraité de la Ligue canadienne de football et vainqueur de la Coupe Grey à quatre reprises, ce programme vise à résoudre la crise entourant les commotions cérébrales au Canada. Depuis les débuts du programme, CLF Canada a mené des initiatives axées sur la prévention et la sensibilisation à la grandeur du pays. Tim Fleiszer, ancien élève de l’école Roslyn, sera présent lors du lancement. Le programme de sensibilisation aux commotions cérébrales se veut une approche proactive ayant pour but de mieux faire connaître les risques liés aux commotions et d’en prévenir les effets secondaires négatifs pouvant survenir à la suite d’un tel traumatisme s’il n’est traité adéquatement. Des bénévoles dûment formés animent des présentations adaptées à l’âge de leur auditoire au moyen d’échanges, de vidéos et de jeux interactifs destinés aux élèves des niveaux primaire et secondaire. Ils y apprennent ce qu’est une commotion cérébrale, comment en reconnaître les signes et les symptômes, ainsi qu’à prendre des décisions judicieuses quant à leur retour au jeu. Ce programme a pour but de fournir aux élèves et aux élèves-athlètes les connaissances essentielles afin qu’ils prennent la situation au sérieux et qu’ils adoptent des pratiques sportives plus sécuritaires. Les écoles intéressées à recevoir la visite d’un animateur sont priées de communiquer avec Katherine Baker à kbaker@emsb.qc.ca. EXAMEN D’HISTOIRE: Le Conseil des commissaires de la CSEM a adopté tout récemment une résolution en lien avec le nouveau programme d’histoire pour les élèves de la troisième et de la quatrième secondaire. Le ministère de l'Éducation et de l'Enseignement supérieur (MEES) s’affaire depuis 2014 à l’élaboration d’un nouveau cours dont le lancement dans les écoles secondaires de la CSEM a eu lieu en août dernier. Le contenu de ce nouveau cours a été vivement critiqué par divers groupes au sein de la communauté, ainsi que par les défenseurs des communautés des Premières Nations, les communautés anglophone et allophone, notamment le Quebec Community Groups Network, et ce, parce qu’il omet largement l’apport historique des minorités culturelles et linguistiques de la province et qu’il promouvoit une idéologie nationaliste unilatérale. Ce nouveau programme n’a pas encore reçu l’approbation finale du ministre de l’Éducation, Sébastien Proulx. De fait, la phase-pilote du curriculum a été prolongée jusqu’en août 2017 afin que d’autres modifications puissent y être apportées. Pour sa part, la CSEM a décidé d’attendre, avant de donner son aval au programme, que des changements y soient apportés afin d’inclure une représentation plus juste de l’apport historique des Premières Nations, de même que des communautés anglophone et allophone, au développement de la société québécoise. Un sondage sera envoyé à tous les enseignants d’histoire. Les résultats pourraient être finalisés juste à temps pour la réunion du Conseil des commissaires qui se tiendra le 14 décembre. PERSPECTIVES D’AVENIR: Le personnel des Services éducatifs et de la technologie de la CSEM a été représenté lors de la conférence de Canadian Parents for French et du Commissariat aux langues officielles intitulée Perspectives d’avenir – Looking Ahead : What now for French Immersion? qui s’est déroulée au Collège Vanier. Le programme d’immersion française a vu le jour il y a 50 ans grâce aux efforts acharnés d’un groupe de parents dévoués sur la Rive-Sud de Montréal. Dans le contexte de l’époque, ces parents ont tôt fait de constater que leurs enfants auraient tout intérêt à apprendre la langue parlée par la majorité afin de réussir au Québec, d’où la création du premier programme d’immersion française au pays. Au fil des ans, plusieurs programmes semblables ont été mis sur pied, et l’apprentissage du français langue seconde est devenu de plus en plus prisé par les commissions scolaires anglophones. Cinquante ans plus tard, ce symposium sur le bilinguisme vise à célébrer les progrès réalisés à ce chapitre et à examiner l’état des programmes de français langue seconde, de même que l’impact sur les jeunes anglophones du Québec, tant sur le plan pédagogique que social. Bon nombre de chercheurs ont traité de ces questions. Une discussion dirigée a également eu lieu au cours de laquelle ces enjeux ont été abordés et des solutions concrètes ont été proposées pour les 50 prochaines années. Veuillez adresser toute demande de renseignement à mwilliams@cpf.ca. DES BAS EN CADEAU: Avec la période des Fêtes qui approche à grand pas, les élèves de l’école secondaire Rosemount, de l’école primaire Dalkeith à Anjou et de l’école primaire Honoré Mercier à Saint-Léonard lanceront une campagne dans le but de recueillir des bas et de les distribuer aux sans-abris de la région de Montréal. Les élèves et le personnel feront don de bas neufs qui seront ensuite remis à quatre organismes : le Refuge pour les femmes de l’Ouest de l’île, Dans la rue, Chez Doris et la Maison Benoît Labre. Chacune des écoles créera également des boîtes-cadeaux personnalisées pour y emballer les bas et rédigera des messages d’espoir bilingues en cette période des Fêtes. Qui plus est, le 7 décembre, les membres du personnel et les élèves de chacune des écoles se réuniront au centre communautaire de l’école secondaire Rosemount (3737, rue Beaubien) pour partager un dîner des Fêtes et emballer personnellement chaque paire de bas. Cette campagne sera dirigée par Vince Lacroce, animateur de vie spirituelle et d’engagement communautaire, avec l’appui et les encouragements de l’équipe de direction de chacune des écoles, sans oublier le soutien et le concours des enseignants de l’école Rosemount (Nathalie Beaudoin, Emmanuela Lambropoulos et Jacklyn Di Genova), de même que de Sandra Trevisonno, enseignante à l’école Dalkeith et Angela Di Lella, enseignante à l’école Honoré Mercier. PROJET BEE-AUTIFUL: À l’école secondaire Laurier Macdonald, les abeilles sont maintenant au cœur même de l’enseignement. Elles créent des occasions d’apprentissage dans les cours de sciences, inspirent les élèves en matière de leadership, incitent au bénévolat et contribuent à l’acquisition de compétences techniques en lien avec les médias. Tous les élèves sont touchés d’une manière ou d’une autre par ce petit insecte pollinisateur. Depuis l’an dernier, les élèves rédigent des articles en français, en anglais et en italien publiés dans différents journaux. Ils ont fait la tournée des classes et du personnel à l’interne, en plus de créer le logo propre à ce projet, une page Facebook ainsi qu’un certain nombre de messages d’intérêt public. Des efforts de sensibilisation ont été déployés au moyen d’une vidéoconférence auprès des écoles primaires Gerald McShane à Montréal-Nord, Mecatina à La Tabatière et l’Académie Sainte-Agathe à Sainte-Agathe-des-Monts. Récemment, les élèves ont pris part à la récolte de miel et ont transmis en personne à leurs camarades et aux élèves du primaire les connaissances acquises au sujet des abeilles, et ce, en visitant les classes et en organisant de petites réunions. CAMPAGNE THÉ-JOUET (TOY TEA): Encore une fois cette année, les élèves de la CSEM recueilleront des jouets neufs dans le cadre de la 25e édition annuelle de Thé-Jouet qui se tiendra le 7 décembre, dans la salle Tudor située au cinquième étage de la maison Ogilvy. Ces jouets seront offerts à plus de 5 000 enfants victimes d’abus et de violence et vivant dans des refuges, ainsi qu’à d’autres organismes de bienfaisance qui viennent en aide aux enfants. Cette année marquera la 14e participation de la CSEM à la campagne Thé-Jouet, mise sur pied par Irene Miller, ancienne conseillère en éducation spirituelle, religieuse et morale. Les représentants des élèves de chacune des écoles, accompagnés de leur animateur de vie spirituelle et d’engagement communautaire respectif, de leurs enseignants, des membres de la direction d’école ainsi que des parents bénévoles, prendront part à cette activité afin de livrer les jouets recueillis et de recevoir des certificats de participation des mains de Claire Kruyt, présidente de la campagne Thé-Jouet, du Père Noël et de la Mère Noël. Pour l’occasion, plusieurs chorales représentant diverses écoles entonneront des chants de Noël. « La campagne Thé-Jouet est une humble cause parce que tous comprennent à qui sont destinés les jouets recueillis », a déclaré Frank Lofeodo, conseiller en accompagnement spirituel et en animation communautaire à la CSEM. « Ce qui est vraiment remarquable, c’est que peu importe le nombre d’élèves qui participent à cette campagne, l’engagement est toujours le même, et les écoles se mobilisent pour prêter main-forte. » Les écoles peuvent participer en recueillant des jouets neufs non violents. Bien que les dons de jouets non violents soient privilégiés et qu’ils devront être déposés non emballés à la salle Tudor, entre 10 h et 16 h le 7 décembre, il est à noter que les dons en argent et les chèques libellés à l’ordre de Thé-Jouet sont également les bienvenus. Pour de plus amples renseignements, visitez le www.toyteamontreal.org. PLEINS FEUX SUR L’ENTREPRENEURIAT: Bien que l’entrepreneuriat ne figure pas officiellement parmi la liste des cours enseignés à l’école secondaire innovatrice Focus de NDG, les élèves y apprennent les rudiments du secteur des affaires et des médias par l’entremise du parcours de formation axée sur l’emploi. Officiellement connu sous le nom de l’atelier Matchstick, le programme a débuté par la création d’une chaîne YouTube afin de diffuser des messages en matinée. Au cours de la dernière année, cette initiative est devenue viable, si bien qu’en plus de rester à jour dans le domaine des technologies et du marketing, les élèves ont commencé à étendre leurs activités à la création par l’entremise de la conception et de la fabrication de bracelets, de canevas prétendus, de même que de petits projets de construction visant à améliorer l’école. À l’heure actuelle, les élèves ont entrepris un projet de reliure dans le cadre duquel ils produiront des recueils fabriqués à la main. « Nous transformions la classe en salle de nouvelles; chaque élève avait un segment assigné qu’il devait rédiger chaque jour », de dire Matt Shapiro, enseignant à l’école secondaire Focus. « Puisque nous dispensions le parcours de formation axée sur l’emploi, de là est venue l’idée de continuer à produire des vidéos, mais tout en créant une mini-entreprise. Nous ne cessons de fabriquer et de créer. » L’école Focus figure parmi les huit établissements du système d’écoles innovatrices de la Commission scolaire English-Montréal. Cette école accueille les élèves ayant eu des difficultés d’adaptation ou d’apprentissage dans le système traditionnel. Nous vous invitons à lire le communiqué de presse. Ces consultations permettront à la ministre Mélanie Joly de procéder à un examen plus approfondi des principaux enjeux et des mesures à prioriser dans l’élaboration d’un nouveau plan d’action pluriannuel en matière de langues officielles. La ministre invite les Canadiens à prendre part à ces consultations en grand nombre et à partager leurs points de vue, ainsi que leurs commentaires, au sujet du rôle du français et de l’anglais dans la société canadienne. Cette consultation se tiendra le samedi 26 novembre, à 14 h, au Salon des gouverneurs du Centre Leonardo da Vinci situé au 8370, boul. Lacordaire, à Saint-Léonard. ATELIER D’ÉDUCALOI : Les élèves du cours d’anglais de cinquième secondaire de Mme Lisa Trotto au Centre d’éducation des adultes Galileo à Montréal-Nord ont reçu un enseignement sur la façon de se préparer en vue de rédiger un texte persuasif. Pour ce faire, quoi de mieux que de s’engager dans un débat avec un juriste? M. Zalman Haouzi, avocat spécialisé en droit criminel et en droits des locataires, leur a rendu visite et leur a donné quelques conseils. Les élèves ont fait preuve d’un grand enthousiasme et de motivation lors de l’atelier d’Éducaloi Choisis ton camp! Cette expérience leur a permis de prendre position sur des questions pertinentes qui ont donné lieu à un débat en classe des plus enflammés! Les élèves ont pu constater par eux-mêmes que la « justice » est un concept vivant qui se construit par le choc des idées et l’évolution des croyances de la société. Cet atelier fut fort instructif et chaque élève s’est vu confier un sujet de recherche. The next Focus will be published on December 22 Submissions should be made to Michael J. Cohen preferably by e-mail (mcohen@emsb.qc.ca) by December 16 at Noon.